Greenhouse Gas Emissions Savings | Controlled Air Inc. 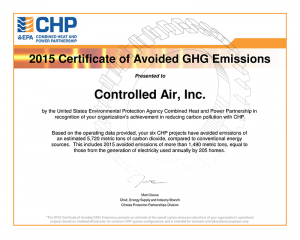 Controlled Air, Inc, is an active member of CHP EPA Partnership. Each year we submit information about the CHP/Cogeneration project that we complete. In 2015 our six CHP projects have avoided emissions of an estimated 5,720 metric tons of carbon dioxide, compared to conventional energy sources. This includes 2015 avoided emissions of more than 1,490 metric tons, equal to that from the generation of electricity used annually by 205 homes. We exceeded 2014’s figures by 1,500 metric tons!